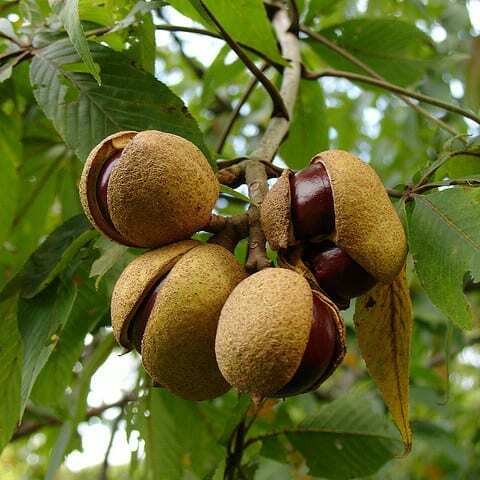 The Ohio Buckeye is moderately long lived and almost impossible to kill, making this North American Native a great addition to the landscape. The bark is ash grey and has a ridged appearance when mature. The branches are a reddish-brown. The buckeye is especially striking in the spring with its showy flowers of a soft lime green hue borne on 4-7″ panicles. In the fall, the frost resistant leaves are one of the first to change color to a reddish brown. In autumn, the tree yields large brown fruit capsules with a light spot at the point of attachment that resembles “the eye of the buck”.